Three different and unique applications—in-die assembly, in-die welding and deep drawing—all paint the same picture, illustrating how digital nitrogen-gas pressure monitors can improve quality and productivity. First, consider the U.S. Army’s desire to build a better bullet, and the creative solution provided by its primary small-caliber supplier, Lake City Army Ammunition Plant, operated by Alliant Techsystems (ATK), Independence, MO. Lake City is the Army’s largest supplier of small-caliber ammunition, the lone survivor among a supply chain that once numbered a dozen different companies. In the last several years—and particularly since 9/11—ATK has seen its production volumes jump to 1.4 billion small-caliber rounds/yr., tripling its output since 2000. Each of the 12 Waterbury Farrel presses that have been upgraded at ATK for the Green Ammo program now boasts four pressure transmitters connected to nitrogen-gas springs, monitoring pressure at four critical die stations (shown here) used during bullet assembly. Supporting the growth at Lake City is an ongoing $280 million manufacturing-equipment modernization program. The program includes updating several 1940s-vintage Waterbury Farrel deep-drawing presses, which ATK refers to as bullet-assembly machines (BAMs). Upgrades to the 30-ton presses will allow ATK to keep pace with the Army’s latest ammunition solution—the Enhanced Performance Round (EPR). The new bullets are “green” (lead-free), featuring a bismuth-tin copper-alloy core and steel penetrating tip. Forming and assembling the new rounds in the Waterbury presses requires ATK to take production-process control to new heights. Its ongoing Green Ammo program eventually will comprise a range of EPR sizes manufactured on 24 presses. To date the firm has completed upgrades to 12 BAMs for one of the EPR products—the M855A1 5.56 x 45 bullet, which has been used in Afghanistan since the spring of 2010. The rounds are manufactured on 12 Waterbury presses, each outfitted with 14-station dies. Bowl-fed copper-alloy cups that enter the die are drawn over several stations to become the bullet jacket. As the drawn cups move through the die, the penetrator gravity-feeds into the jacket. Trim stations follow, then an ogive sizing and assembly station, additional sizing stations and a final cannelure or knurl station. Presses stroke at 60 hits/min. “The design engineers that developed the process specified that we must closely monitor and track gas-spring forces in the die,” says ATK engineer John Segovia. “Insufficient force (from a leak in the nitrogen-gas supply system, for example) or over-pressurized gas springs trigger a press shutdown before out-of-specification bullets are fabricated. Metal stamper GR Spring & Stamping is well-versed in in-die welding—30 of its dies include in-die nut-welding stations. On larger dies, the firm pipes nitrogen-gas springs together so it can pump up and dial down weld pressure as needed. The firm has retrofitted electronic pressure monitors on two dies running on a 200-ton press at its Kentucky plant, to gauge weld force applied by the gas springs. By “too complicated” Segovia means that the load cells were touchy and over-sensitive to pressroom conditions. In less than two years the company spent $65,000 replacing broken load cells; experienced press downtime to the tune of $680,000, caused by faulty load cells; and paid out another $55,000 to its electrical-engineering department to recalibrate the machines every time a load cell failed. “We had to find a better, most cost-effective, reliable and accurate solution for monitoring the spring forces,” says Segovia. 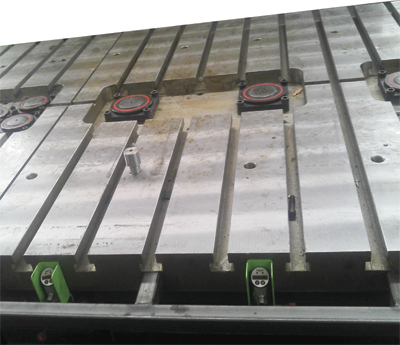 To replace the load cells, Segovia opted to install electronic pressure monitors (from Dadco). Each of the 12 BAMs that have been upgraded for the Green Ammo program now boasts four pressure transmitters connected to nitrogen-gas springs, and a central control panel mounted on the press ram. The pressure monitors provide a 22-lbf resolution, offering significantly more process control compared to the 316-lbf resolution of the load cells. 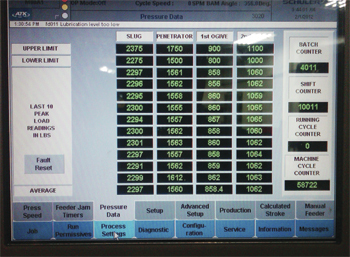 Since installing the electronic pressure monitors, maintenance issues are nonexistent, maximizing press uptime. And the facility is busy preparing a dozen or so additional BAMs similarly to continue to support the Army’s EPR programs. 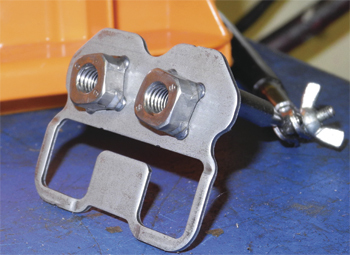 Resistance-weld quality hinges on three key process variables—time, pressure and current. When welding inside a stamping die, pressure often proves the most difficult variable to control. Metal stamper GR Spring & Stamping, understands this well—well-versed in in-die welding, 30 of its dies include in-die nut-welding stations. On larger dies, the firm pipes nitrogen-gas springs together so it can pump up and dial down weld pressure as needed. Measuring and monitoring gas pressure initially fell to analog switches, which would trigger press shutdowns if nitrogen pressure dropped beyond an allowable setpoint, perhaps due to a worn spring or a leaky tubing connection. Voit has electronic pressure monitors (shown here protected by green enclosures) installed on three presses, and will retrofit a fourth press this spring. The monitors gauge pressure to 14 nitrogen-gas springs installed at key stations in each press table. To ensure zero-PPM parts delivered to customers, typically GR Spring & Stamping, based in Grand Rapids, MI, and with additional facilities in Chihuahua, Mexico, and Richmond, KY, requires operators to perform push-off tests on in-die welds once every hour. Should a weld fail such a test, an hour’s worth of parts is quarantined for further testing. To avoid these unproductive quality checks and the costly quarantine of suspect parts, the firm has retrofitted Dadco electronic pressure monitors on two dies running on a 200-ton press at its Kentucky plant. The monitors, which gauge weld force applied by nitrogen gas springs, have allowed the plant to adjust its schedule for performing weld push-off tests to just once per shift, a huge productivity gainer. In addition to less-frequent destructive testing and greater assurance that the in-die welding process is performing as designed, using the electronic nitrogen-pressure monitors has eased the troubleshooting process. Tolerances on deep-drawn servo-motor and booster housings stamped at the Voit Automotive facility in El Salto, Jalisco, Mexico, average ±0.002-0.003 in. That level of precision requires state-of-the-art process control, says engineering manager Raphael Zazzaretta, which is why he’s sold on using electronic pressure monitors at critical nitrogen-gas-spring die locations. The plant has the Dadco electronic pressure monitors installed on three presses, and will retrofit a fourth press this spring. Responsibility for in-die pressure control falls to a set of 14 nitrogen-gas springs installed in the press table, not the die. “This setup makes it easier for us to achieve the required level of precision compared to using a press cushion,” says Zazzaretta. Eight of the die’s 14 stations contain nitrogen springs. At the draw stations, the springs act as a cushion Each spring connects to an electronic pressure switch—14 separate switches connected to the nitrogen filling station. Now, the firm no longer has to worry about nitrogen-gas pressure causing quality issues with this critical die. With part volumes approaching 3 million/yr., the die is running with a PPM of zero. This is a significant improvement compared to a PPM of 300 when the project first launched, without the electronic pressure monitors.